Happy Tuesday, friends! 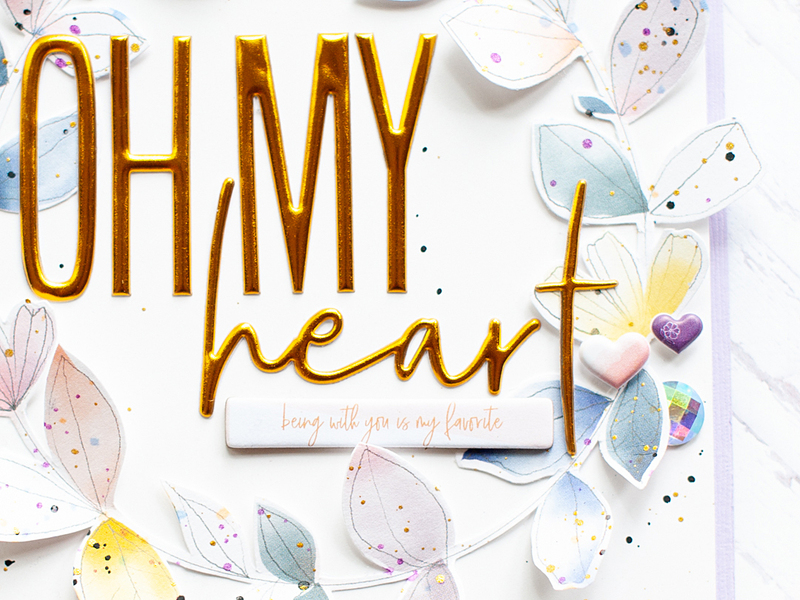 While I do have a project to share with you, and a pretty amazing GIVEAWAY for you...I wanted to reflect a little bit. 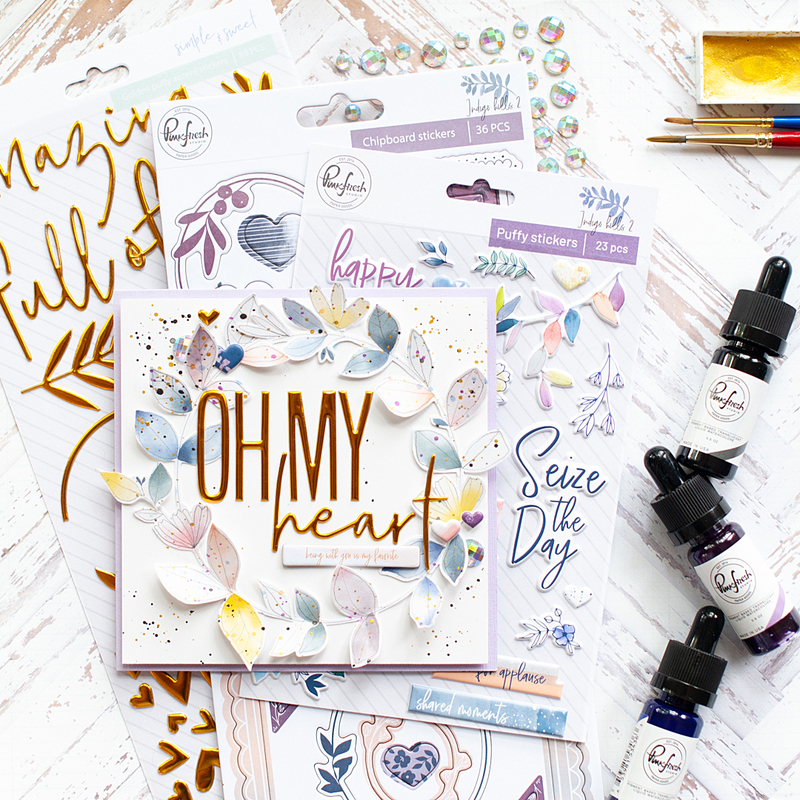 This time last year my Crafty Comeback Party had just started off, and I was getting back to this little part of my world that I once loved so fiercely. Almost 30 different companies welcomed me back with opened arms, many that didn't really even know me before Ellie & Layton...and helped make my comeback party a success. I still couldn't be more grateful. You came alongside me, and my dream of providing the NICU where Layton spent all of his days with (50) $50 Starbucks giftcards for parents with little ones a lot like Layton. A goal that started out at $2500, with your generosity & support became almost $12,000... and I was also able to provide them with $5000 in gas cards, and $5000 in hotel stays on top of the Starbucks gift cards. I can never repay the gift of helping me keep the memory of my kids alive...I am just so thankful. 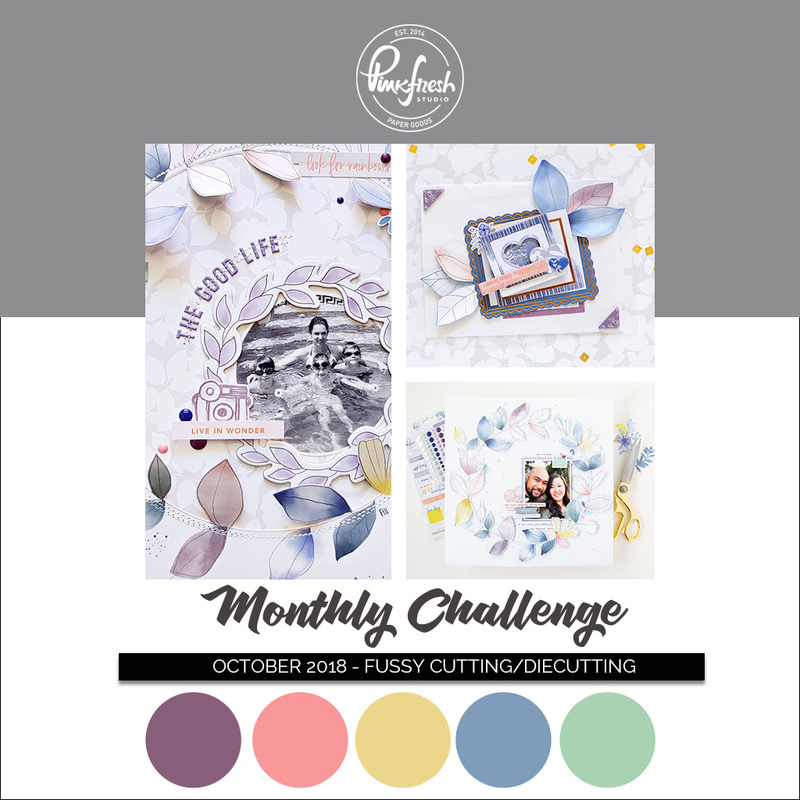 I went back to my scrapbooking roots to create this card, and fussy cut the gorgeous leafy wreath from one of the the Indigo Hills 2 6x6 papers. 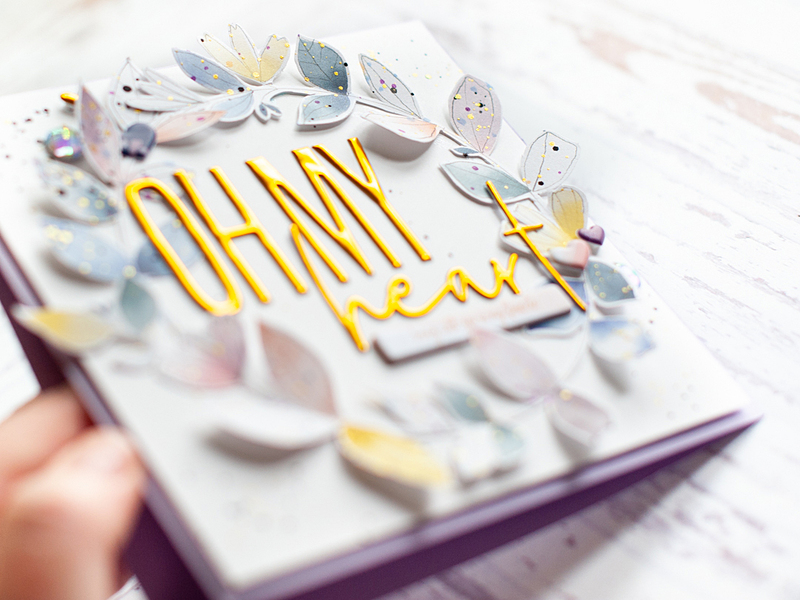 I kept it scrappy and created a sentiment from embellishments & puffy stickers, rather than stamping & diecutting. Check it out! To start I fussy cut the leafy wreath from patterened paper. Then I flicked some liquid watercolor splatters in Sapphire & Lavender to the wreath, and adhered it to a 5.25x5.25 square block of heavyweight white cardstock. Then I mounted that with foam adhesive to a 5.5x5.5 square card in light purple cardstock. Next I flicked some black splatters to the corners using Licorice liquid watercolor, and then added gold splatters in the same areas. I avoided the middle as much as possible - I did get a couple of rogue splatters, which was okay. I just didn't want to get a ton in the middle! 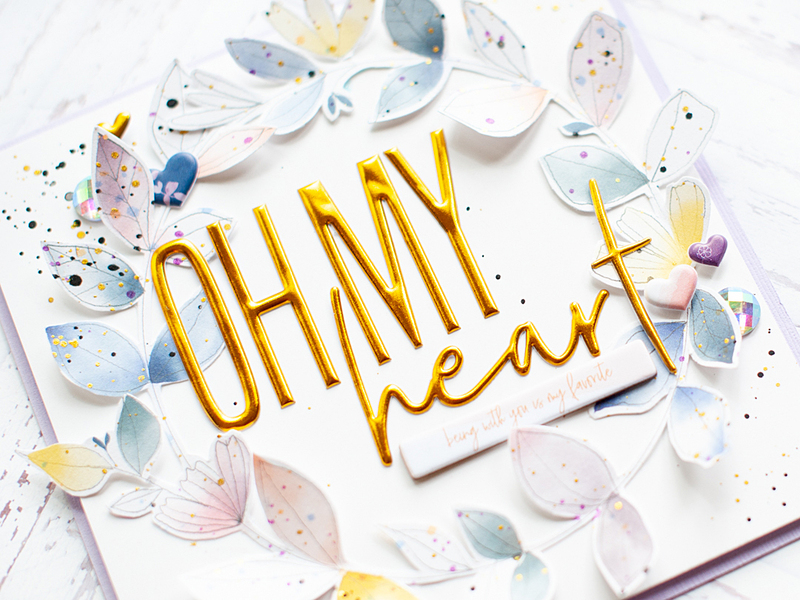 Once the splatters were dry, I added the sentiment to the middle of the card using the Gold Puffy Stickers from Pinkfresh Studio's Simple & Sweet collection. Then I added the Indigo Hills 2 chipboard sticker below it that says, "being with you is my favorite." To finish, I accented around two opposite corners of sentiment with puffy hearts & iridescent jewels. 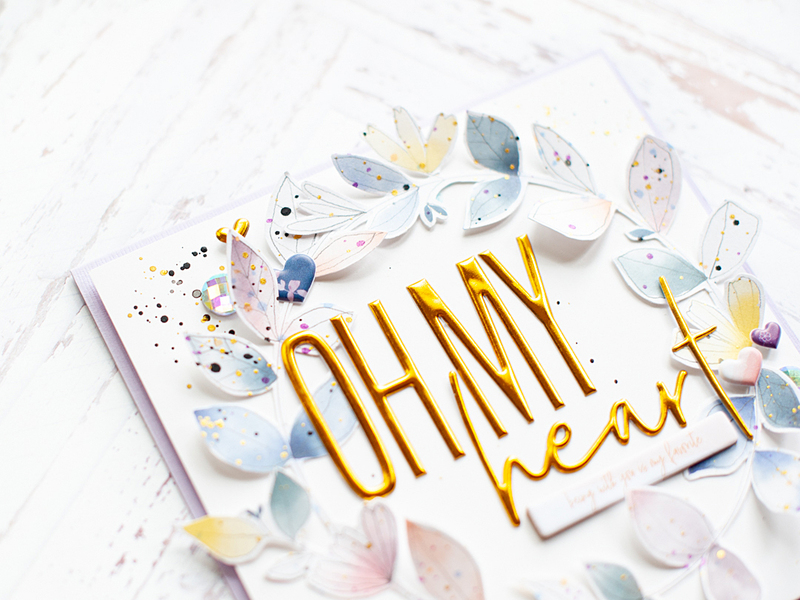 I just love how the gold puffy stickers & gold paint splatters give this card a beautiful amount of shine! I love making sweet love cards like this, and think it would be perfect for an anniversary, or just everyday. 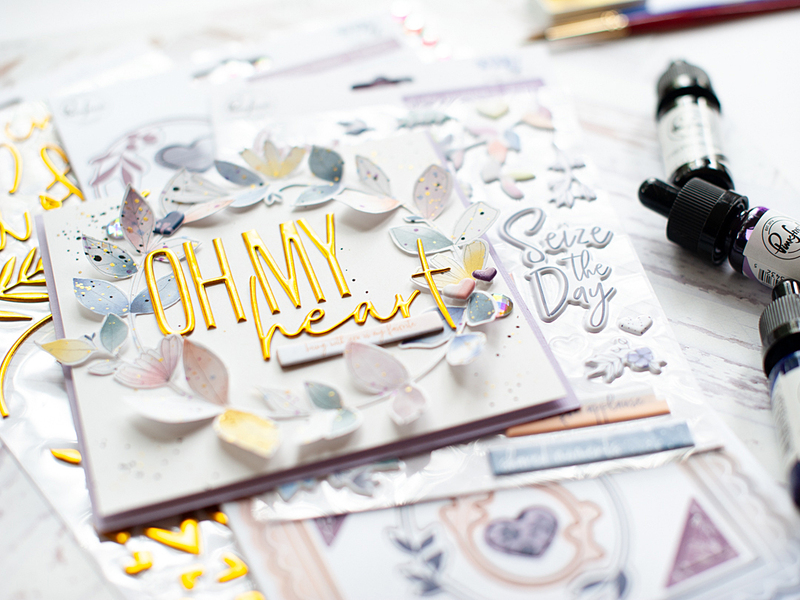 That is the fun card I had to share today using my scrapooking supplies, rather than my stamping ones! :) Okay friends...how about we get to my giveaway? I have a set of Pinkfresh Studio liquid watercolors in the glass bottles to giveaway! Just leave a separate comment for each one, even if you already do! All I ask is that you do them because you actually want - not just to win a giveaway. I will post the winner on my GIVEAWAY WINNERS page on Sunday, October 14th by 2pm CST. Please be sure to look there & follow the instructions at the top for claiming your prize. I also will be giving away a set of the liquid watercolors in the new plastic bottles on my Instagram feed shortly...just look for the card above & follow the prompts...as that is where the giveaway will be hosted! 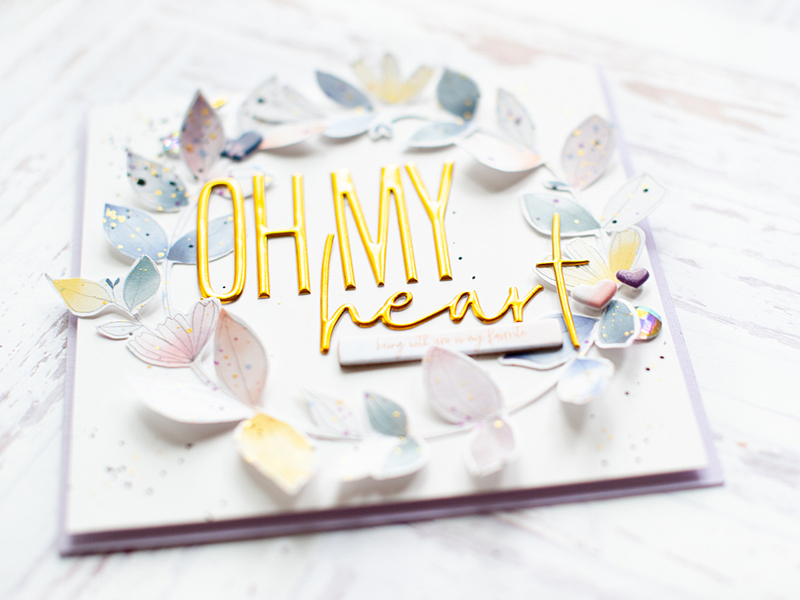 Thank you so much for reading my blog, commenting, and being part of my love for cardmaking! I hope that you have a wonderful rest of your Tuesday! Stunning work !! I can see why they opened their arms for you ..you're a gifted artest..wishing you all the best and thanks for your generosity..
Lea, I have enjoyed cheering for you in your comeback. 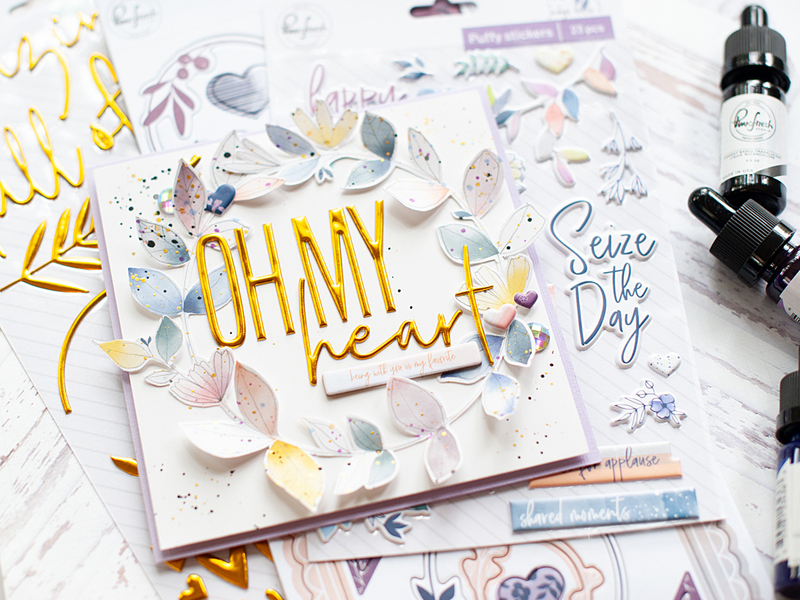 Your cards and projects are beautiful. You are inspiring by honoring your children's memory by helping families on the journey you have gone through. Providing them a warm hug with the coffee & gas cards to help their NICU journey. I thank you for sharing your journey it has to help me understand what my mom went through when I was born. Your card today is beautiful. I am so glad you came back Lea. We missed your creativity! I would be thrilled to win these beautiful watercolors and put them to use. What a wonderful and amazing story! I love the generosity of this community and your gorgeous cards! Stunning work and I love following you on Instagram and now on YouTube! It's been wonderful having you back in the crafting world! I love your style and your heart! 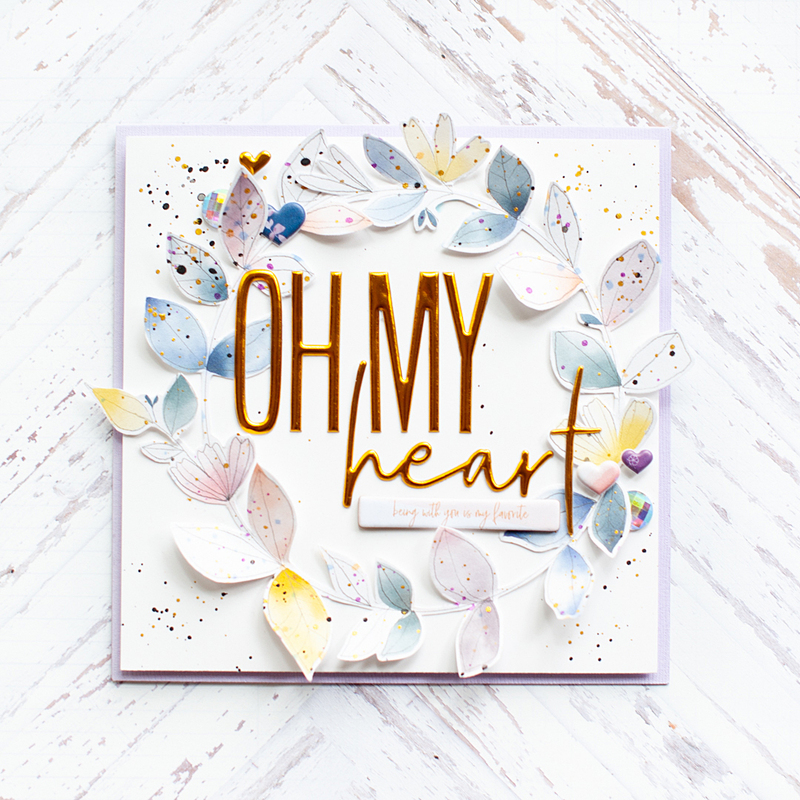 This card is so lovely and soft, but has such wonderful texture and sparkle! I'm subscribed to your YouTube channel. Hello from Singapore!! So happy with your comeback. Your creations are gorgeous! I am relatively new to crafting and watercolouring, so I'll be following closely to you on your Instagram, blog and even YouTube! Rooting for you and thank you for this opportunity! Love the softness and yet their vibrancy. Beautiful work Lea! And always thanks for sharing and posting! I am your youtube subscriber! Love the colors of the card with the gold sticker sentiments. Never think to use stickers on cards! Just subscribed to your YouTube channel. Thanks for the chance to win these watercolors. Such a beautiful card! Lovely colors and details! Wow your cards are amazing. So glad your journey has made you a strength for others and an inspiration to many. I follow you on Instagram already. I already following you on Youtube. Fabulous card! You are an amazing person! Beautiful card. 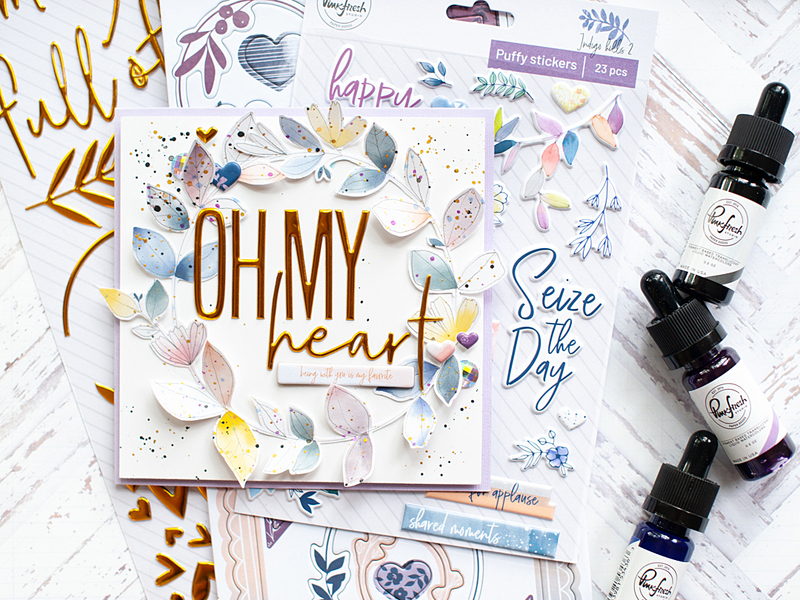 It's refreshing to see a card made with products other than stamps and dies. You are an amazing crafter! Your story has touched my heart and I am so inspired by you. Your one of the few I first followed when I started crafting. Your card is stunning! What a beautiful card Lea. Sometimes I remember to use tricks that I learned when I scrapbooked and I wonder why I don't do it more often. This really IS beautiful! Congratulations on landing your dream job, how wonderful! I also follow your YT channel. Lea, I am so glad this amazing crafting community has not onl6 provided you with comfort and support but has also embraced your talents. Lovely.. I remember when you came back.. your cards were so beautiful and I just felt it was your release, your sharing of the kids. It was amazing.. And now, a year later and your art is still stunning and spectacular. Congrats and hats off to you (and your family). Lea, I have followed you this past year with such excitement and joy. I have a special folder on my Pinterest Papercrafts Board for "Lea Lawson" so that I can refer back to your ideas. I love that someone so talented shares their talent with the world. I am excited that you are part of Pinkfresh Studios - one of my favorites. And, in fact, I am going to be looking to see if you have any YouTube videos on using the liquid watercolors. I want to get some, but first I want to see how to use them. I now follow you on YouTube - Yay! Only me again to let you know I've followed you on you tube for same time as your blog. Sorry I don't use Instagram as it hates my tablet for some reason. Take care. Beautiful wreath card. I like the gold letters, splatters and little hearts. I follow you on IG as waterlily57. I follow you on IG, glad you are back. Your card is beautiful! Your creativity constantly amazes me & makes me realize to stretch a bit more than my comfort zone. thank you! Beautiful cad and what a life change you've had the last year. Congrats on the dream job as well! Thank you for the giveaway and I look forward to following your work with Pinkfresh. I follow you on IG (@amymadduxcooley). Thanks! I'm following you on YouTube. Thanks! I follow you from a long time, so happy you are back. Thanks for the giveaway. It's been a pleasure getting to know you recently. I only discovered your work during Layton's bloghop, and I was so impressed by your charitable spirit and your grace as you took your heartbreak and tried to ease other parents' pain. I had no idea you had been out of the crafting world, but I'm glad you're back. I enjoy your art and your kind soul. I also follow you on Instagram (@annalisaarts). I just started following you on youtube! I thought I already did, but that must have just been a video off Pinkfresh's feed. Gee darn, more crafty videos to watch! And i am jellybeanerz aka christine kiehl on youtube as well. thanks for all you do! Your card is so delicate and pretty! I discovered your blog last year during your crafty comeback and I've thoroughly enjoyed your work over the past year. Thank you for all you've done to support and uplift other parents and for this generous opportunity. Hi Lea, I'm deeply touched by your story! I discovered your blog last year during the Crafty Comeback Party and I started to love your amazing technique. 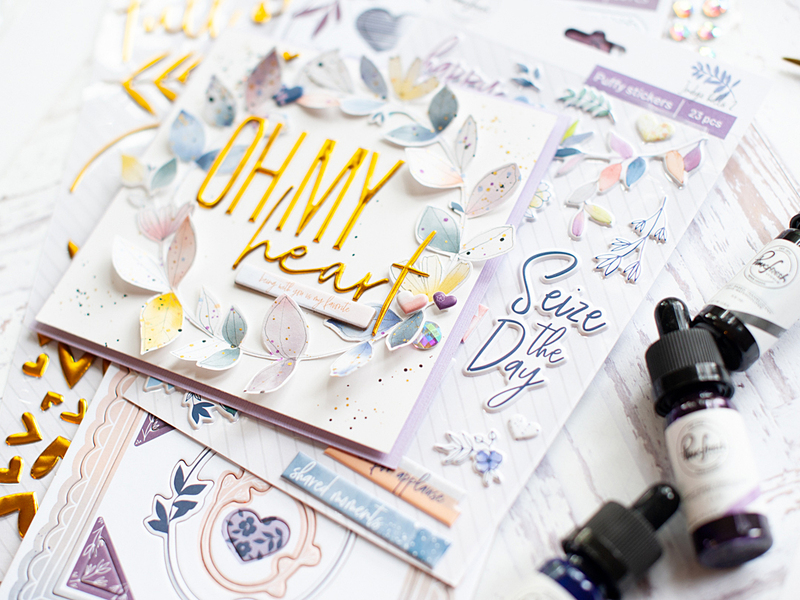 In particular way your colouring and your card layouts are really amazing! 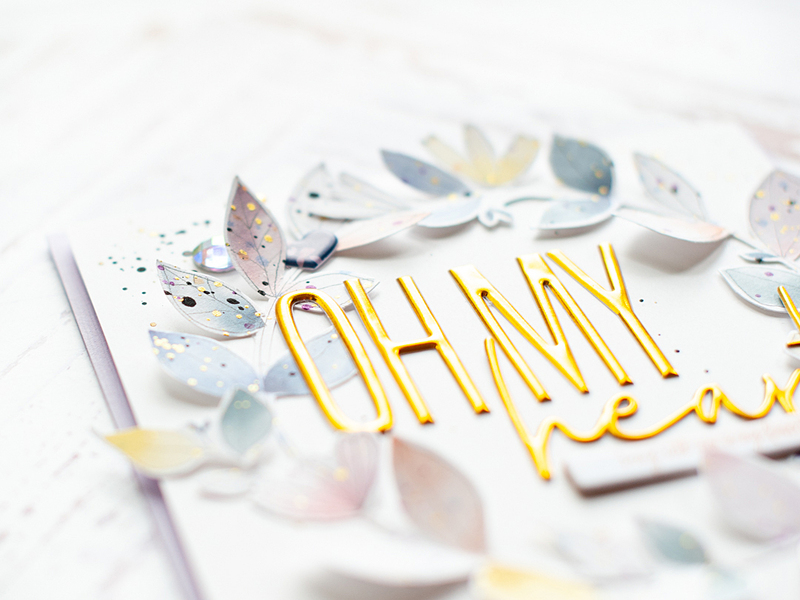 What a lovely blog - I'm so glad crafting and the community bring you joy! It's certainly MY happy place! What a wonderful story, thanks for continuing to share your amazing journey. 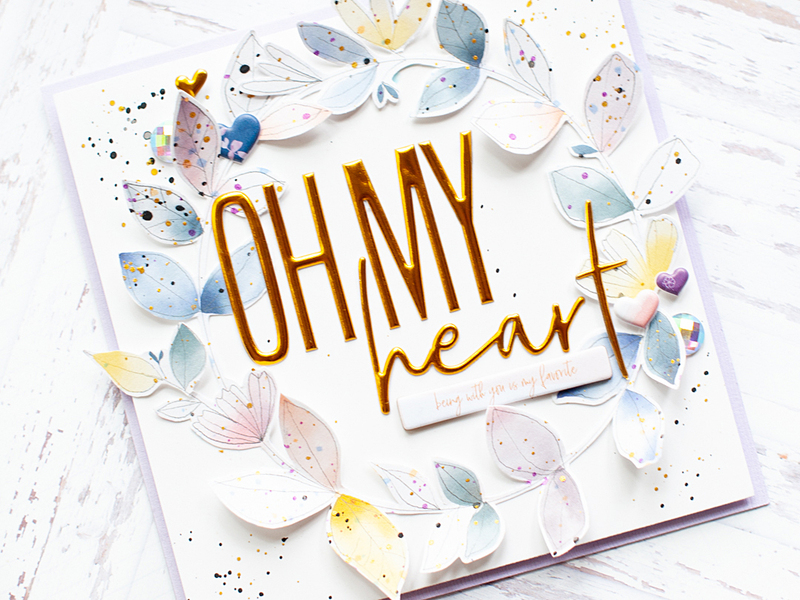 Oh and your card is fabulous, LOVE LOVE LOVE the splatters! I'm subscribed to your awesome You Tube channel! I follow you on Instagram, LOVE!